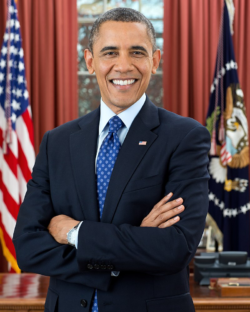 Taken together, President Barack Obama’s immigration policies amounted to a centrist approach, with individual policies garnering harsh criticism from both extremes of the debate on U.S. immigration as he balanced a desire to welcome new immigrants and provide sensible reform regarding the 12 million undocumented immigrants in the country, while also enforcing current laws and keeping the nation’s borders secure. During the first years of Obama’s presidency, the number of immigrants deported from the U.S. increased each year, peaking at 409,849 total deportations in fiscal 2012. At the time, pro-immigrant groups nicknamed Obama the “deporter-in-chief” in protest of the policies. After 2012, the annual deportation number decreased, totaling just 235,413 deportations in fiscal 2015. In 2012 Obama signed an executive order creating the Deferred Action for Childhood Arrivals (DACA) policy to allow undocumented immigrants who had been brought to the United States as children to apply for renewable two-year periods of deferred action from deportation, allowing them to remain in the country and making them eligible for work permits. Although DACA targeted some of the same thorny social issues as the DREAM Act, it does not provide for a path to citizenship for those enrolled. In 2014 Obama announced plans to create a related program, Deferred Action for Parents of Americans and Lawful Permanent Residents (DAPA). Like DACA, DAPA would have offered renewable deferred action status and work permits for individuals in the country illegally — in this case, parents of children who are U.S. citizens or lawful permanent residents. Several lawsuits from state governments led to a 2015 injunction blocking DAPA’s implementation. In 2017 the Trump administration announced plans to rescind DAPA. In 2016 Obama’s administration proposed the International Entrepreneur Rule to help foreign-born entrepreneurs to remain in the U.S. as they expand their companies. The rule provided for so-called “startup visas” to encourage entrepreneurs from other countries to establish their businesses in the U.S.